Understanding the geologic processes responsible for ocean floor features unexplained by simple plate tectonics, such as abyssal hills, seamounts, microplates, and propagating rifts. Improving tsunami hazard forecast accuracy by mapping the deep ocean topography that steers tsunami wave energy. Determining the effects of bathymetry and seafloor roughness on ocean circulation, mixing, climate, and biological communities, habitats, and mobility. Mapping the marine gravity field to improve inertial navigation and provide homogeneous coverage of continental margins. Providing bathymetric maps for numerous other practical applications, including reconnaissance for submarine cable and pipeline routes, improving tide models, and assessing potential territorial claims to the seabed under the United Nations Convention on the Law of the Sea. Because ocean bathymetry is a fundamental measurement of our planet, there is a broad spectrum of interest from government, the research community, industry, and the general public (e.g. Google Earth). Figure 1. Global marine gravity (left) and vertical gravity gradient (VGG – right) for the Indian Ocean. Red dots (earthquakes M>5) highlight the three spreading ridges forming the Indian Ocean Triple Junction. The gravity fields were derived from all altimeter data available in 2014 (Sandwell et al., 2014) and are available in a variety of formats here. Figure 2. Along track sea surface slope profiles from CryoSat-2 (66 of the of 84 mo. available today) and AltiKa (7 mo.) around Hawaii. Both satellites are healthy and still collecting data. AltiKa profiles are two times more precise than all previous altimeters (Table 1). Waveform Retracking — The first is to continue to analyze existing altimeter waveforms to optimize their range precision and short-wavelength accuracy. 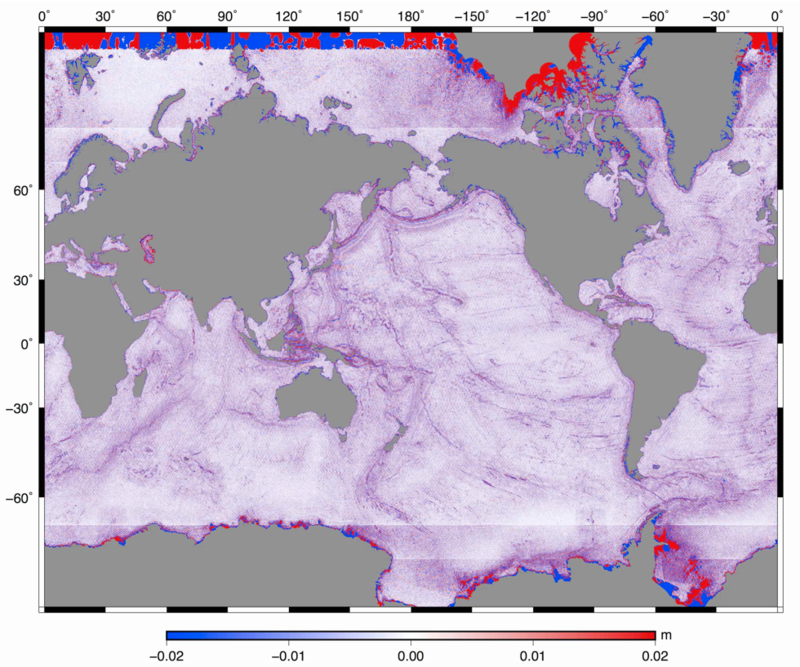 Mean Sea Surface — The second is the construction of a high-resolution mean sea surface height model in collaboration with scientists at CLS/CNES. High spatial resolution and improved accuracy in coastal areas will be needed at the start of the SWOT mission for CAL/VAL as well as to produce oceanographic results. CAL/VAL for Gravity Recovery — The third is to develop super resolution sea surface slope models along the tracklines of the commissioning phase using existing multibeam bathymetry surveys. Waveform Retracking — Over the past two decades our group has worked with raw radar waveform data from Geosat, ERS-1, Jason-1, Envisat, CryoSat-2, and AltiKa to reduce the small spatial scale noise in the altimeter range measurements due to altimeter bandwidth limitations and ocean waves (Table 1 from Zhang and Sandwell, 2016). Ocean swell produces one of the largest errors in standard radar altimetry because the sharp radar chirp emitted by the satellite is blurred by reflection from the irregular ocean surface. The length of the blurring is related to the significant wave height so it is typically 1-2 m. Recovery of sea surface slope to an accuracy of 1 microradian over a horizontal distance of 10 km requires a range precision of 1 cm, which is 100 times smaller than the rise length of the leading edge of the return echo. This 100-fold improvement in range precision is achieved by averaging thousands of independent pulses both along-track and from near repeat cycles. Recovery of 1 microradian at 1 km length scale will require millimeter range precision. Through modeling, consultation with the SWOT engineers, and analysis of AirSWOT data we propose to achieve a better understanding of the fundamental limitations placed by the ocean swell signal on the recovery of the sea surface slope at the smallest scales in both the along-track and cross-track directions. This will help to guide the measurement requirements for ocean applications. Standard deviation of altimeter waveforms with respect to the 1 Hz average. The non-AltiKa analysis was published in Garcia et al. (2014). Mean Sea Surface — We are working with SWOT scientists at CLS/CNES (Phillippe Schaeffer and Gerald Dibarboure) to produce a new mean sea surface grid (MSS) at one-minute spatial resolution. High spatial resolution and good accuracy in coastal areas will be needed at the start of the SWOT mission for CAL/VAL as well as to produce oceanographic results. The method combines the accurate MSS along tracklines of repeat altimeters (e.g., Topex, Jason-1/2, ERS-1/2 and Envisat) with the retracked waveforms from the geodetic missions (Geosat, ERS-1/GM, Hason-1/GM, and Cryosat-2). An example of the difference between the new MSS grid and the original CLS grid is shown in Figure 3. The CLS group is currently evaluating this model. Figure 3. Top: The difference between the new MSS grid and the original CLS grid. Bottom: Zoom of an area in South Pacific has mean and standard deviation of -0.001 m and 0.0051 m, respectively. Larger differences occur in the diamond shaped areas that are not well sampled by the repeat-track altimeters. Differences are greatest in areas of high sea surface slope such as the Eltanin Fracture Zone and Louisville Ridge. 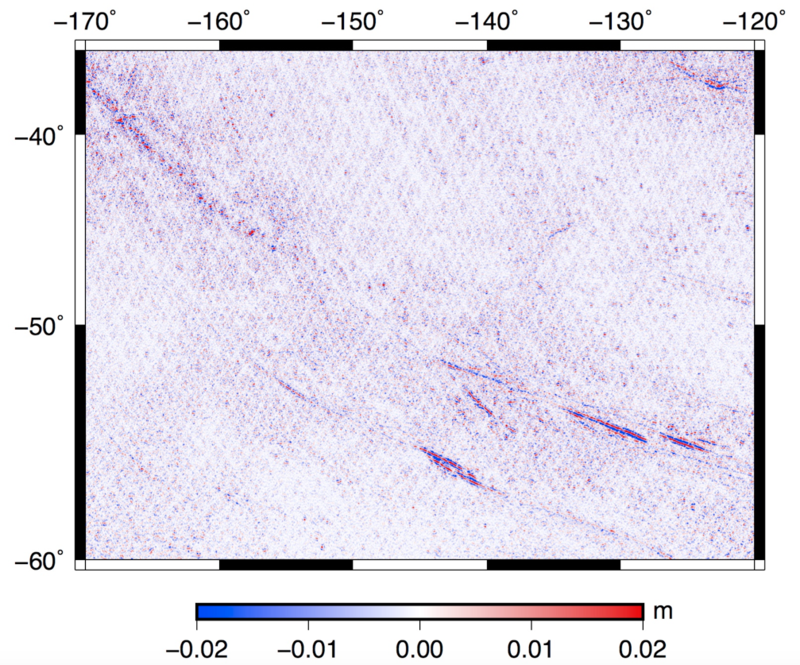 CAL/VAL for Gravity Recovery — The third is to develop super resolution sea surface slope models along the tracklines of the commissioning phase using existing multibeam bathymetry surveys. We have identified 19 regions along the swaths of the commissioning phase where high-resolution multibeam data exist. The approach will be to take the best existing sea surface slope models and low-pass filter them at 25 km wavelength where we know they have accuracy better than 1 microradian. We will construct a very high-resolution geoid slope model from the bathymetry and high pass filter it at 25 km wavelengths. The two models will be combined to form a super resolution model of sea surface slope having ~2 km resolution above the crests of the shallow seamounts. These will be compared with the SWOT data to better understand its accuracy and resolution capabilities. The 19 regions provide a variety of oceanographic conditions of significant wave height and mesoscale variability. Figure 4. High-resolution (500 m) bathymetry of the Foundation Seamounts in the South Pacific from extensive multibeam surveys of the R/V Sonne and R/V L'Atalante (Devey et al., 1977). Also shown are the swaths of the SWOT altimeter during the commissioning phase of the mission. Many of these large seamounts have crests shallower than 1000 m so produce high amplitude, high-resolution geoid slopes. This is also a region of low significant wave height and low mesoscale variability so it is optimal for exploring the ultimate resolution of the SWOT altimetry. These three analyses will be most valuable to the SWOT mission during the commissioning phase. The high spatial resolution, mean sea surface can be used to understand the cross-track accuracy of the SWOT data. The super resolution sea surface slope models will be useful in evaluating the performance of SWOT as well as to tune the algorithms and spatial filters for production of higher-level products. Following the commissioning phase we will work with the SWOT team to achieve the marine geophysics objectives. Devey, C.W., R. Hékinian, D. Ackermand, N. Binard, B. Francke, C. Hémond, V. Kapsimalis, S. Lorenc, M. Maia, H. Möller, K. Perrot, J. Pracht, T. Rogers, K. Stattegger, S. Steinke, P. Victor (1997). 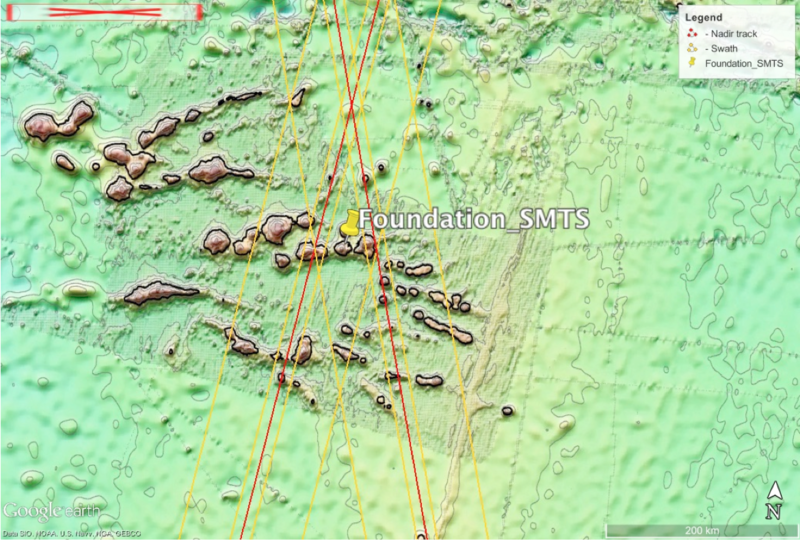 The Foundation seamount chain: a first survey and sampling. Marine Geology. 137 (3–4): 191–200. doi:10.1016/S0025-3227(96)00104-1. Garcia, E., D.T. Sandwell, W.H.F. Smith, 2014. Retracking CryoSat-2, Envisat, and Jason-1 Radar Altimetry Waveforms for Improved Gravity Field Recovery, Geophysical Journal International, doi: 10.1093/gji/ggt469. Sandwell, D.T., R.D. Müller, W.H.F. Smith, E. Garcia, R. Francis, 2014. New global marine gravity model from CryoSat-2 and Jason-1 reveals buried tectonic structure, Science, Vol. 346, no. 6205, pp. 65-67, doi: 10.1126/science.1258213. Zhang, S. and D.T. Sandwell, 2016. Retracking of SARAL/AltiKa Radar Altimetry Waveforms for Optimal Gravity Field Recovery, Marine Geodesy, DOI:10.1080/01490419.2016.1265032. Zhang, S., Sandwell, D.T., Jin, T. and Li, D., 2017. Inversion of marine gravity anomalies over southeastern China seas from multi-satellite altimeter vertical deflections. Journal of Applied Geophysics, 137, pp.128-137.